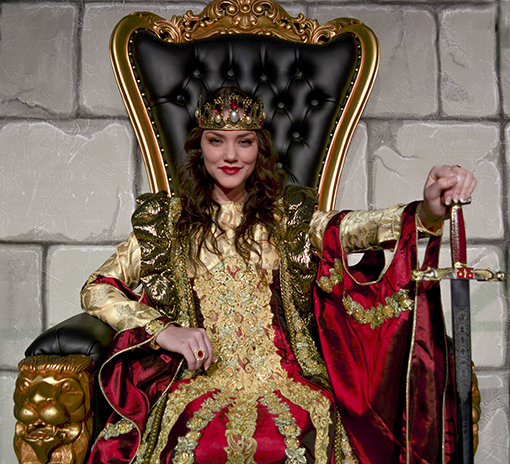 There's a new Queen on the throne at Medieval Times Atlanta! While she may not sit upon an iron throne, from the very beginning she demonstrates—and you feel—that she rules her kingdom with an iron fist, perched high above the arena while graciously hosting her feast and tournament guests, as well as her knights and other loyal subjects. You have the wonderful opportunity to meet the new Queen when you first arrive. As soon as you enter the Great Hall (the lobby) and have received your Medieval Times crown, you're invited to a photo-op with either the Queen or another member of the Royal Family. The Queen is an absolute royal delight. We had our photo made with her! There's no obligation to purchase, but if you decided to, you can pick them up at the photo station after the show, or before the show depending on how early you arrive. And they're in a handsome gold frame ready to display! 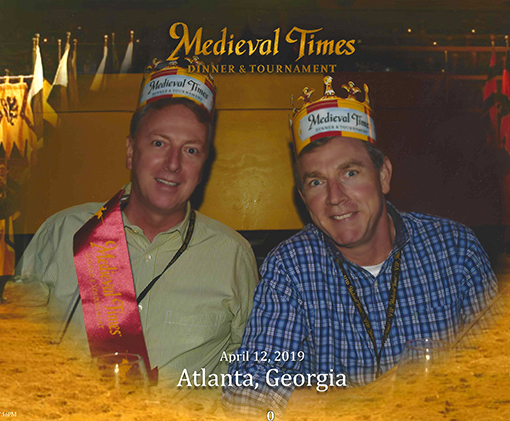 My first Medieval Times experience was at the Atlanta Castle in 2013 and I've returned many, many times, approximately 1-2 times per year since. This particular visit was my first VIP upgrade and it was AWESOME! Among other fantastic royal treatments, we were seated on the front row! A truly spectacular view! The final season of Game of Thrones is now underway, making the experience all the more exciting. Fans are excited for a new season, but sad that it'll be the last. 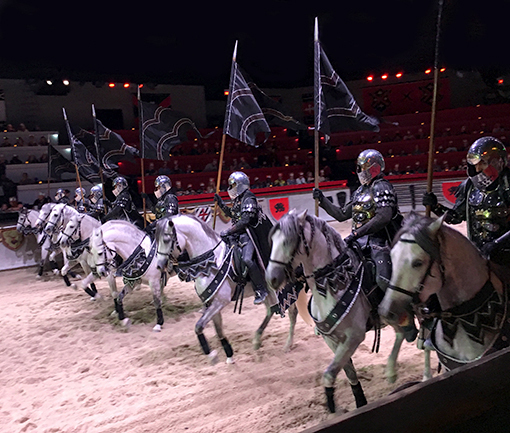 Fortunately, you can visit Medieval Times most days of the week, some Monday holidays, and there are even some matinees. My favorite time to go is Friday evenings...it's a great way to unwind for the weekend! In Game of Thrones, you see jousting as early as the 4th episode in Season One. 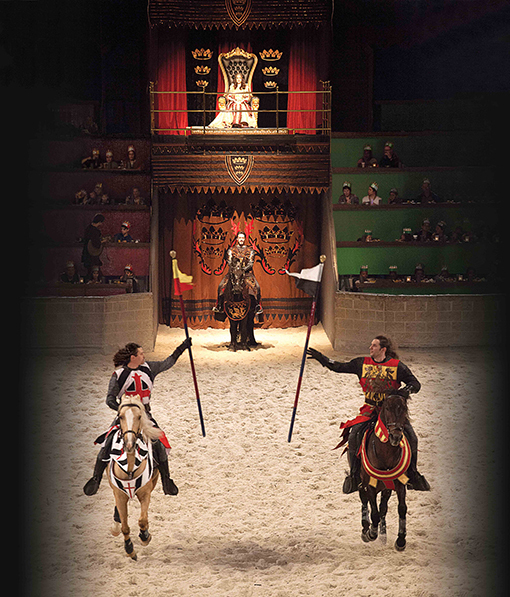 But at Medieval Times, you don't have to wait that long and it's live, up close and personal! They're fighting for their Queen, after all. This is one of most fun "dinner and a show" experiences out there! Arrive early to enjoy a drink (with lots of souvenir glasses to choose from) and to explore the lobby, which features numerous suits of armor and a fire place the size of which I could stand in! You can also meet the falcon that will be in the show, see a live owl with one of the widest wingspans, and you even have the option of being knighted—lots of fun for those celebrating birthdays or other special occasions. If you'd like wine with your dinner, you can pre-order it prior to the show and it'll be bought to your table. You can also buy a libations from your table, either beer, wine or cocktails. The feast is exactly that...a FEAST! You'll be given a choice of beverage: soda, tea or water--you get two pours of that each. Then comes the piping hot "Dragon's Blood"! (tomato bisque). The buttery thick-slice toast is crunchy, delicious and great for sopping up your dragon's blood. The main course features Baby Dragon (half a roast chicken! ), a Dragon Scale (roasted half potato), and corn on the cob. Dessert used to be a flaky baked pastry, but now it's...ICE CREAM! They even offer a vegetarian meal for those who wish to forego the dragon. Before you enjoy the four-course feast and two-hour tournament, you might want to treat yourself to a little torture, literally. There's a "torture chamber" in the main lobby, guarded by a royal toll-taker (there's a modest fee for admission). 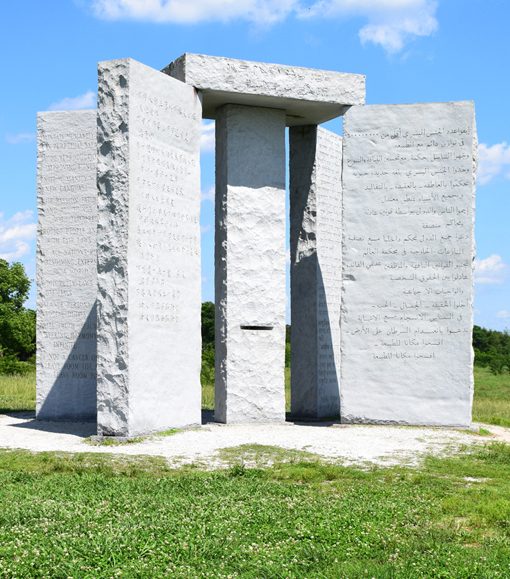 I've visited before...it stirs the imagination to say the very least! After the tournament, head back into the lobby where you can make all the free photos you want with the knights that you just saw compete in the Queen's tournament! Get a photo with your favorite knight or all of them! 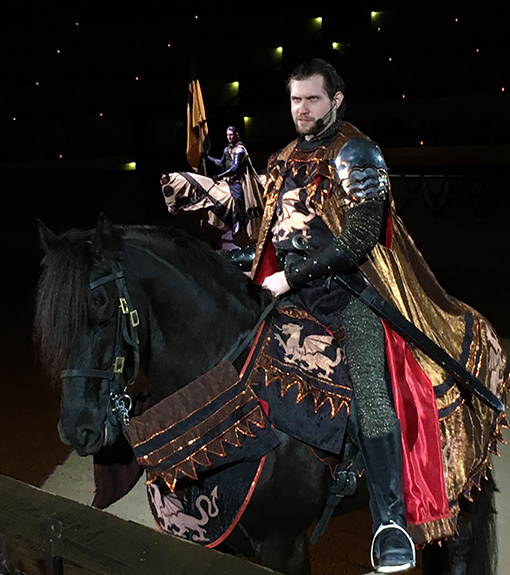 Be sure to tag the photos you post on social media with #MTFan or #MTFans! Be sure to explore the amply supplied gift shop where you can acquire a vast array or treasures ranging from a new tunic to a handsomely engraved long sword or perhaps your very own dragon. I have quite the handsome dagger from a previous visit and I keep eyeballing the full-size swords...I know one of those will be going home with me eventually. Probably two, to be honest! My friend Barry went with me on this visit and we had a grand time! I've been to Medieval Times with many friends over the years, but most often with Barry. It's equally a fun 'guys night out' or a 'girls night out', or a family night out or a work team building outing...you can make it a fun evening out for any number of groups! Or "just because" is my favorite reason. Just for clarification and not that it matters, what looks like a sash across my chest, is actually a Medieval Times pennant, which guests love waving furiously to celebrate their knight during the tournament, and it's complimentary with the VIP package. Please consider the VIP experience—worth every penny—but know that wherever you are seated in the arena, you're sure to have a great time! I have every single time I've been! Enhance your Game of Thrones final season experience with a taste of the real thing, without the gore, of course, but with knights, equestrian beauty and grace, a generous dose of royal chivalry, and a beautiful new Queen! 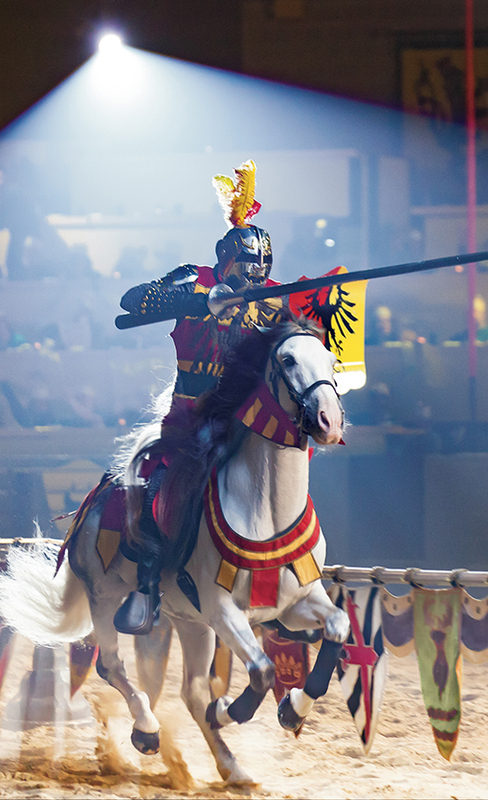 Go, be a knight or princess for an evening at Medieval Times Atlanta! 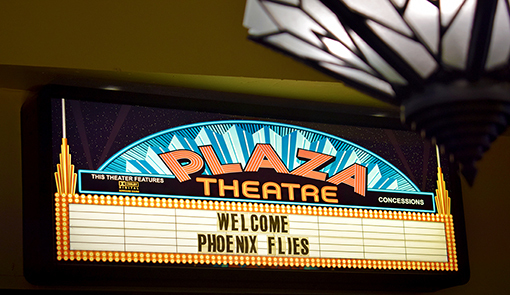 This year's Phoenix Flies tours, an Atlanta Preservation Center program, have been fantastic, including "Atlanta’s oldest operating and only independent cinema since 1939", Plaza Theatre! The tour was led by none other than the owner himself, Christopher (Chris) Escobar, who purchased the theatre in 2017. The tour started on time (Thank you, Chris!) and was entertaining and substantial! A few of us hung around afterward and got to see some additional spaces, too! The first time I ever saw The Rocky Horror Picture Show was in 2010 at Plaza Theatre! It was so AWESOME! Lips Down on Dixie, Atlanta's longest running cast, has delivered a screen-accurate performance of The Rocky Horror Picture Show every Friday night since December 2000! Talk about "Time Warp"! 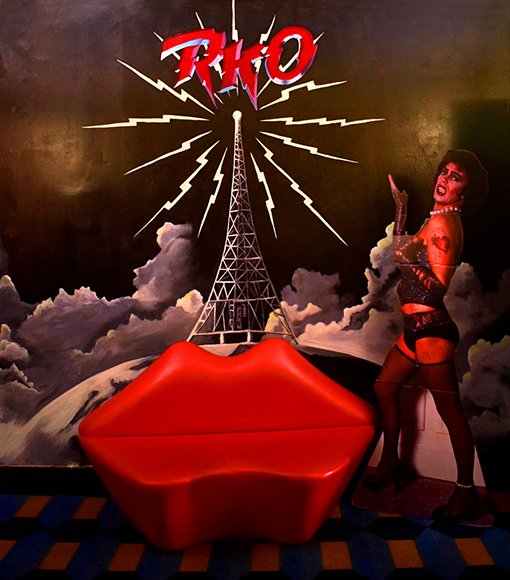 The photo above is "the" Rocky Horror photo-op in the theatre! While the midnight performances are geared for younger adult audiences, I had such an amazing time when I went. If you haven't seen it performed live (simultaneous with the film), treat yourself! There were more approximately 30 of us on the tour—and we were greeted with free popcorn! It was a full theatre experience, plus we had a movie score playing while we were gathering. We were welcomed on the screening room "marquee", too! There's a new ticket stand in the lobby, fashioned after some other Art Deco elements in the theatre. 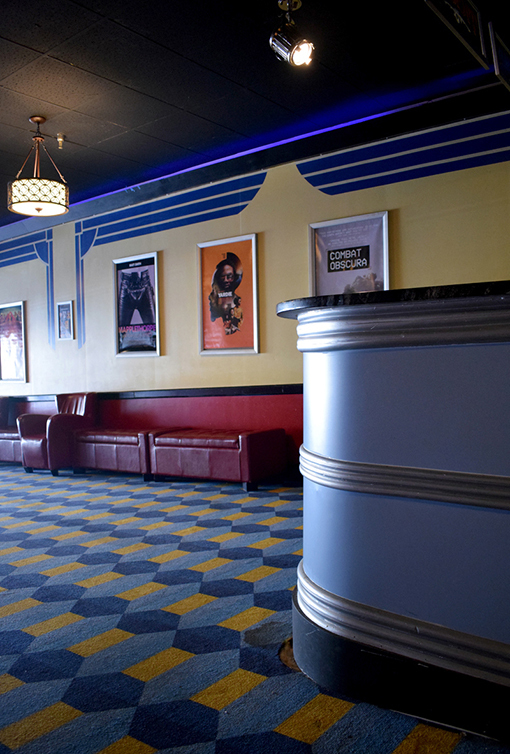 LOTS of new updates and upgrades are and will be influenced by the theatre's Art Deco design and decor. Being one of my favorite design eras, I was loving it! 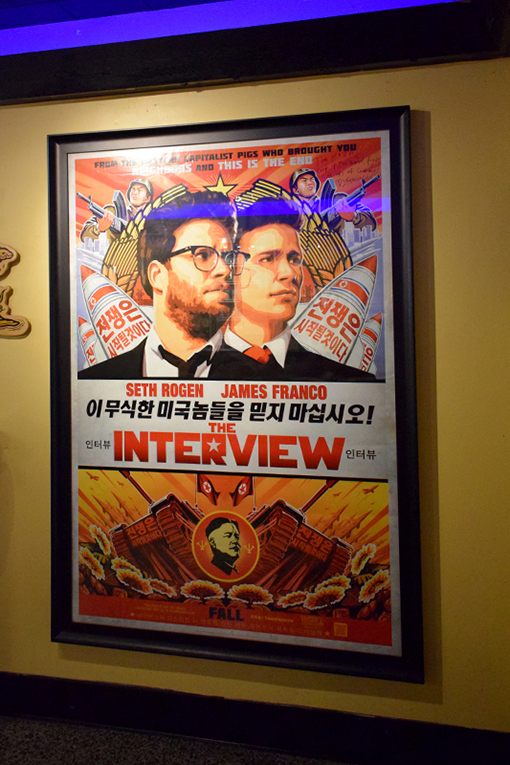 Many of us on the tour didn't know that Plaza Theatre was one of a handful of small theatres to screen the world premiere of The Interview, starring Seth Rogen and James Franco, (on Christmas Day in 2014)—and the exclusive theatre in Atlanta—an epic move on their part after major movie studios allowed a foreign government to influence our censorship practices. It was quite the scandal! Within 24 hours of announcing that Plaza Theatre would premiere the film, they gave approximately 40 interviews...to local and global news outlets! In this same area—the Gallery—are the concessions stand—featuring only classic theatre treats, and a new bar—featuring more than 20 local craft beers and more! Plaza Theatre now has a movie house organ and a dedicated organist! Ron Carter, the lead organist, was there to play for us, share some of the history of theatre organs, and to let us know that Plaza Theatre will be featuring the organ—which sounds phenomenal!—during a monthly silent movie, as well as during the pre-show of The Rocky Horror Picture Show! I'm super excited about a monthly silent film accompanied by a live organist. I've seen/heard the occasional silent movie with live music, but I don't know of anywhere else in Atlanta who's doing this. Do check it out! One of the awesome upgrades are the super cushy seats! There are a lot of theatres, even the mainstream theatres, that have thin seats that tax the tooshie, or "gluteus maximus" if you're more the scientific sort. I love that the seats have an Art Deco stitched design, too! 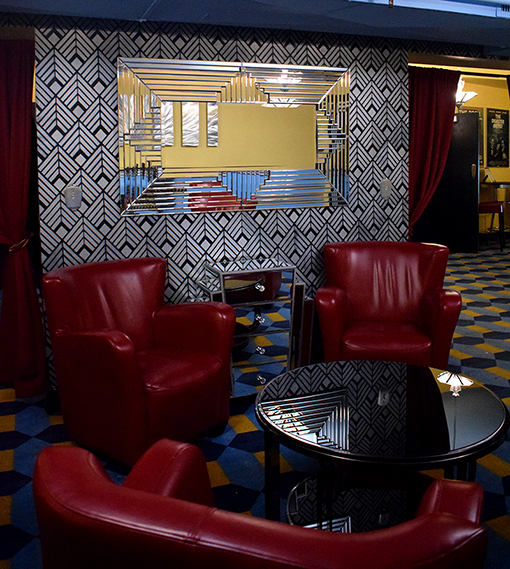 The "Legacy Lounge" has Art Deco stenciled walls (hand-stenciled by Chris and his wife! 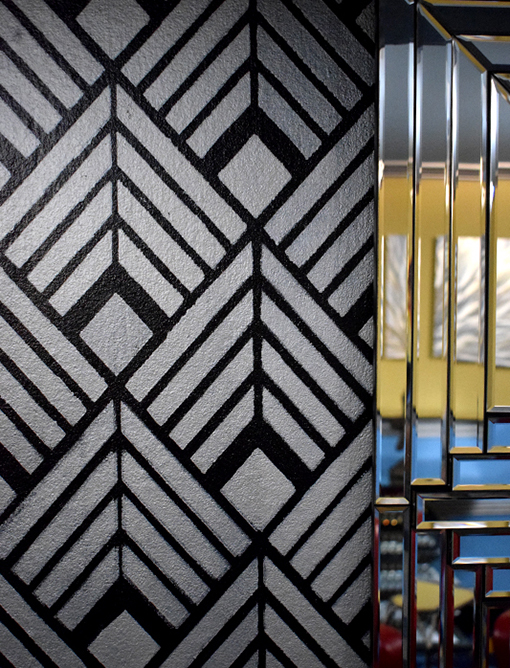 ), Art Deco inspired pieces of furniture, and even the bathroom door handles are Art Deco! And there's more to come. Hearing Chris' ideas for what he wants to do to improve the physical space of the theatre as well as the programming was inspiring, to say the least. Chris said the hand-stenciling needs touching up, but it looks awesome to me! I was shocked to find out that it was stenciled and not wallpaper! Theatres across the country were required to go digital by the end of 2013 and as expensive as it was to do, Plaza Theatre did just that, went digital. This was a move by Hollywood studios to save on printing and shipping 35mm movies to theatres across the country. They're even converting their 35mm inventory to save on storage space. 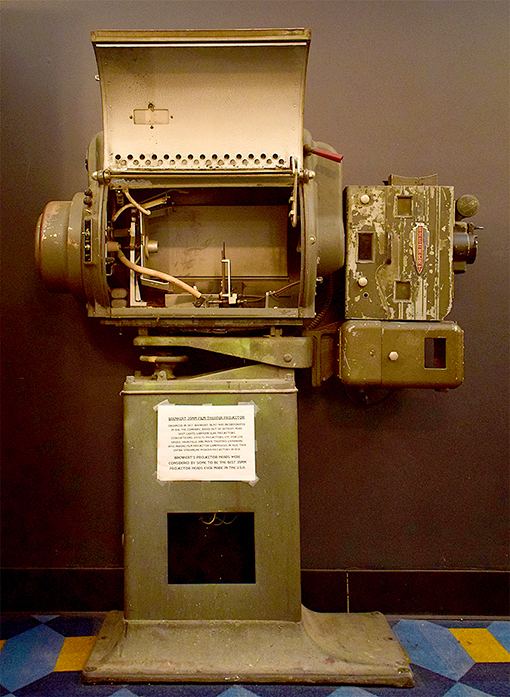 Not too long ago, after Chris purchased the theatre and was cleaning up, he found what he thought was—I forget what he thought it was, but it wasn't the 35mm projector that it turned out to be! He found two and one of them is on display in the theatre. 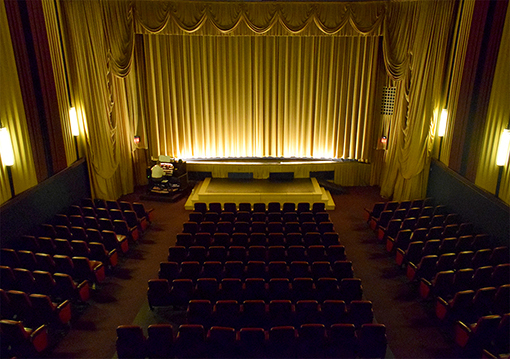 Chris hopes to have them restored and again show films on 35mm on special occasions. 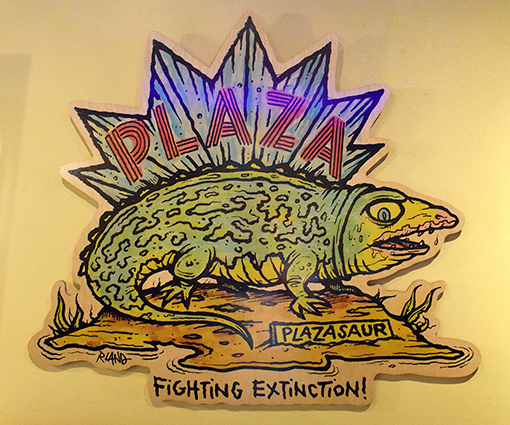 Plaza Theatre has faced extinction, probably more than once, but with Chris Escobar at the helm, there's only the plan to expand, improve, and to continue entertaining. 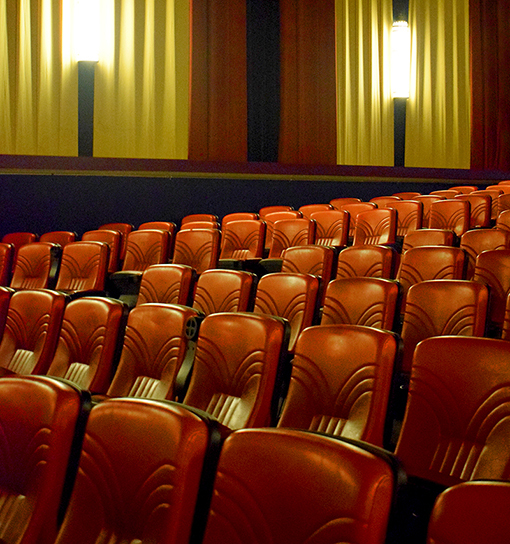 Make your way to Plaza Theatre to take in a film—the variety is vast! And if you didn't make it on any of the 200+ free tours and events in the Atlanta Preservation Center's Phoenix Flies program, make a note to do so next year! My personal favorite season of the year is summer, but NOTHING beats spring at the Atlanta Botanical Garden! 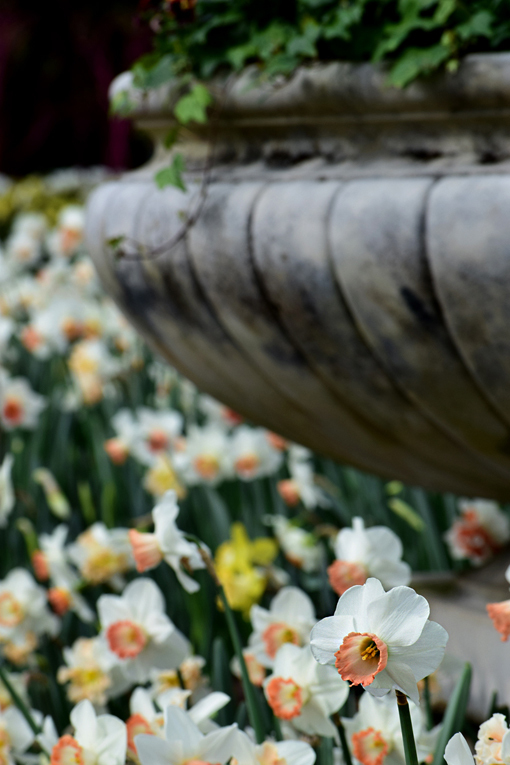 Year after year after year, the Atlanta Botanical Garden showcases spring's floral bounty like nowhere else! And the "Atlanta Blooms!" event/exhibition more spectacular than ever! 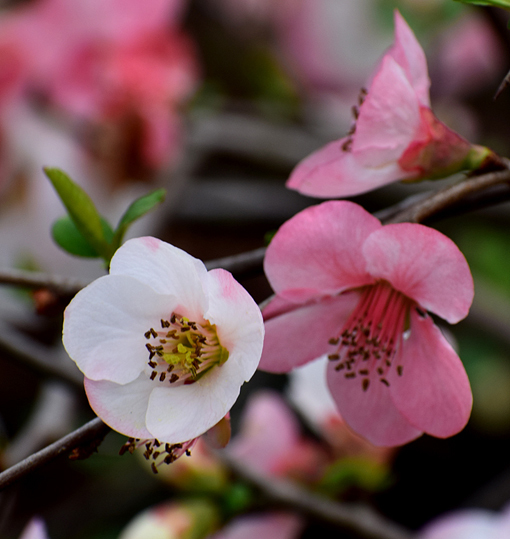 Did the few below-freezing nights last week kill all blossoms? No...no, no, no. This is Atlanta! 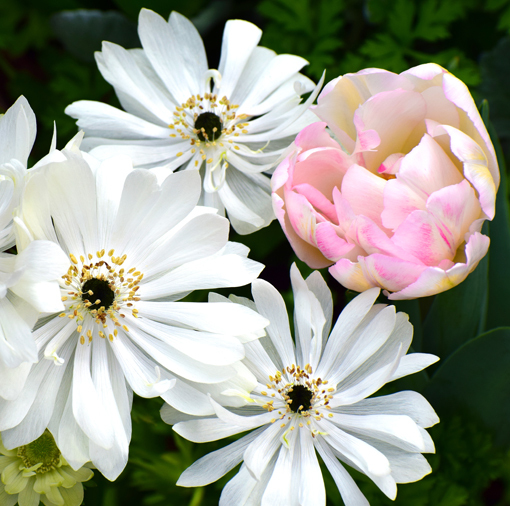 The Garden is ablaze with blossoms, but spring turns to summer very quickly here, so go soon so you don't miss the hundreds of thousands of blossoms gracing the Garden right now! If you can't make it to the Garden on the weekend, come out to "Garden Party" on Thursday night, March 21! This is going to be THE garden party of the year! 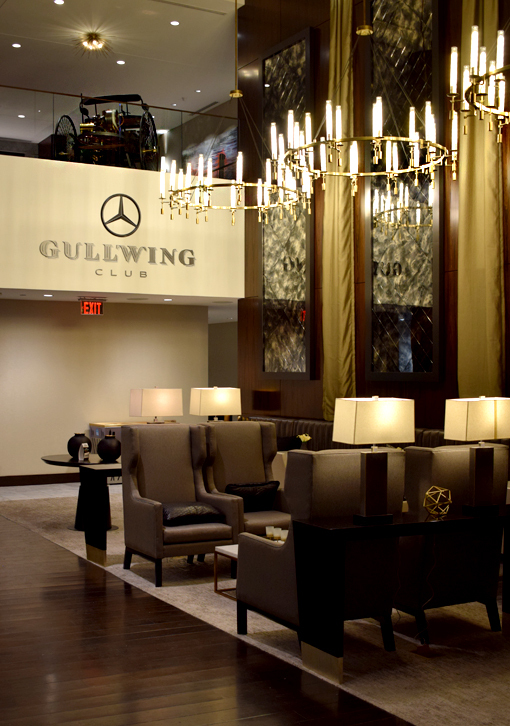 You'll get to enjoy beer, wine, and a bubbly bar! AND, you'll be among the first to taste the Garden's new collaboration beer, a blend of lime leaves harvested from the Fuqua Conservatory's trees with hints of hibiscus and lemongrass made in partnership with Wild Heaven Brewery! There will also be lots of photo ops, activities, food options and numerous live music experiences! By the way, locals, if you're a member of the Garden, you get to attend events like this for free! It's the one membership I renew year after year! I've shared this story before, but I love telling it, so I hope you'll indulge me. My favorite flower is the tulip. Because of my late grandmother, Evelyn. I don't remember this but it's a story my mother has told countless times. 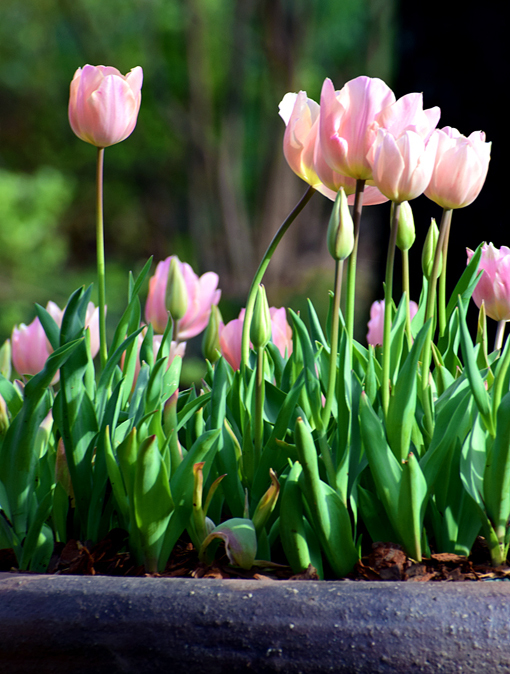 One spring, when I was a toddler, there was a late freeze that killed all of grandmother's tulips except for one (this was farther north, so they weren't as resilient as Atlanta's tulips). The next day, into the house walks little Travis exclaiming to my mother, "Flower, mommy, flower!" I'd picked the sole freeze-surviving tulip! 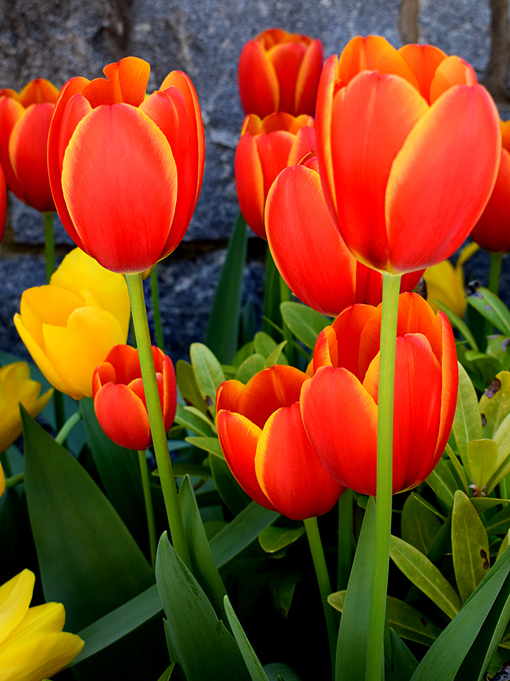 I've loved tulips since hearing this story the first time, when I was still a little kid! What's your favorite springtime blossom? I think the "Atlanta Blooms!" exhibit planners are brilliantly gifted. 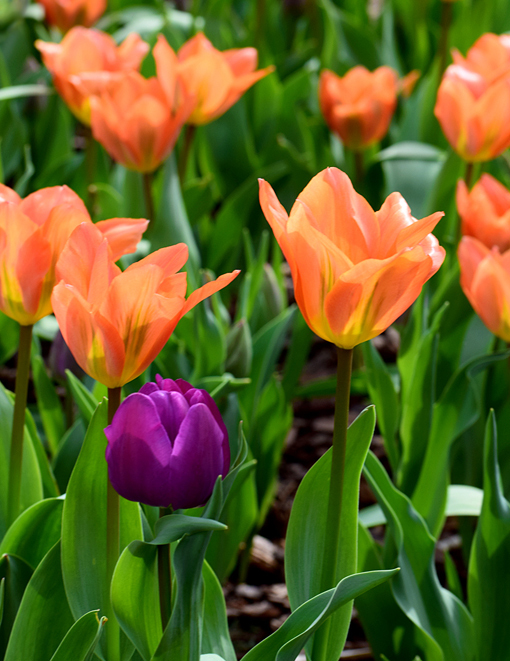 Again, they've included in this year's exhibition--which was planted in the fall--Pantone's "Color of the Year", which is "Living Coral", very close to the color of all the tulips in the above photo, except for the obvious purple one. This is huge, people! Pantone's "Color of the Year" influences fashion, special event themes, home decor...it's a color you'll see throughout the year, yet the Atlanta Botanical Garden planted it months and months before the actual announcement. Pure brilliance! 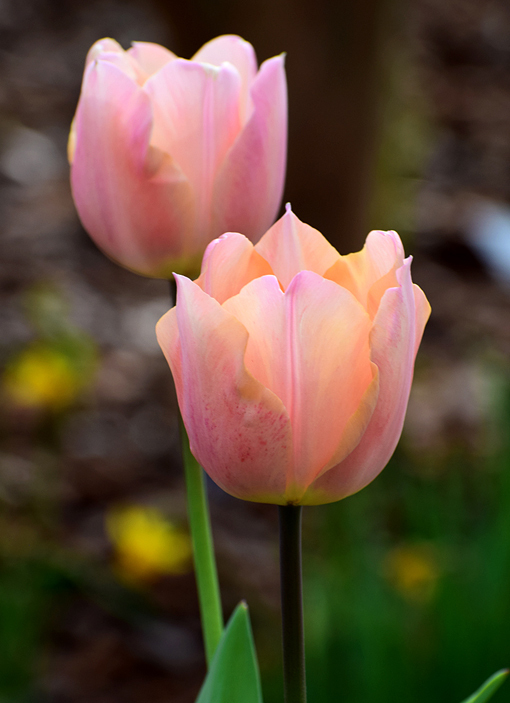 There is no filter on the above photos...these tulips are gorgeously bright pink! And I love the coupling of several other flowers in this bed. You'll find these leading into the relatively new Skyline Garden behind the Conservatory. If you go to "Atlanta Blooms!" 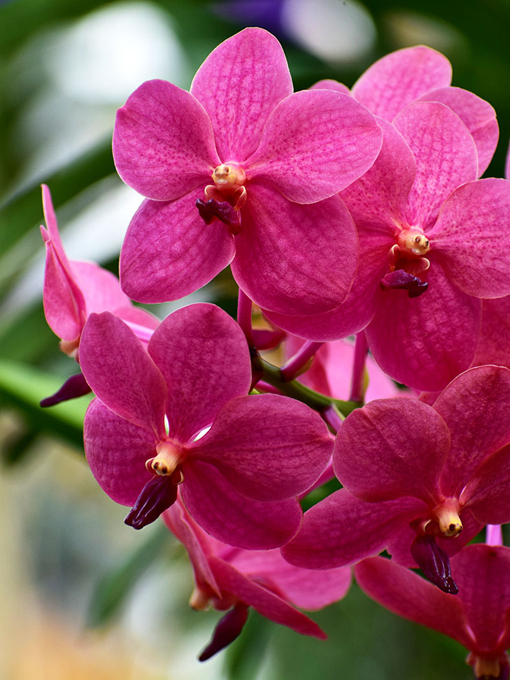 in the next few weeks, you'll also get to enjoy "Orchid Daze", Atlanta Botanical Garden's annual orchid exhibition featuring an additional thousands of orchid blossoms coupled with the largest collection of orchid species in the United States! Have you heard of the "Ugly Food Movement"? It's especially strong in Europe and Australia. Meanwhile, the United States disposes of 40% of the food that we grow, some of it just because it's "ugly"...not pretty enough for grocery store shelves. 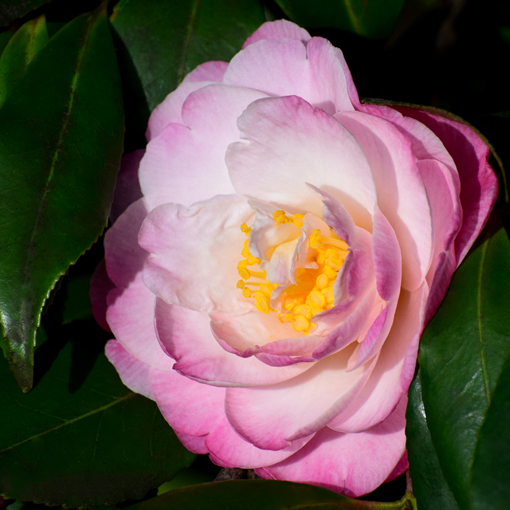 The above camellia has a petal that's fallen into its stamen...it's not less beautiful, in my humble opinion. It's "real". My point is, of course, share your best photos, but those can include the not "perfect". I think this one is stunning! If you were not among the thousands and thousands of people who recently saw Yayoi Kusama: Infinity Mirrors at the High Museum of Art, you can still see one of her installations at the Atlanta Botanical Garden...Narcissus Garden through spring! 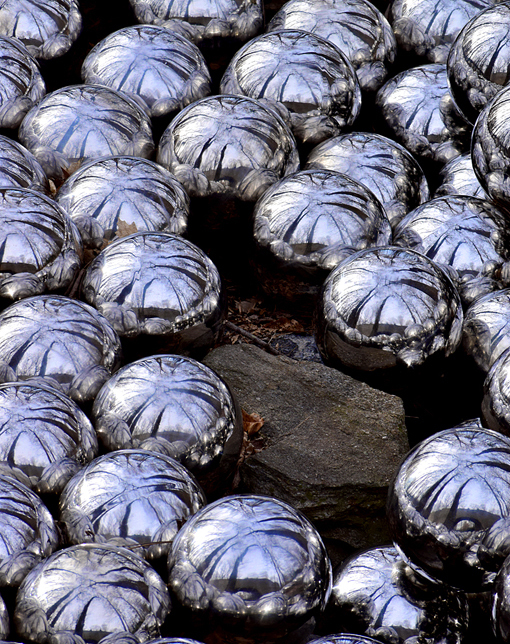 Narcissus Garden was first presented in 1966 and is comprised of 1,400 stainless steel spheres! With every inch you change your viewing perspective, you get a unique view/experience of this installation...and this time of year, it'll change day-to-day as the Garden gets more and more green! 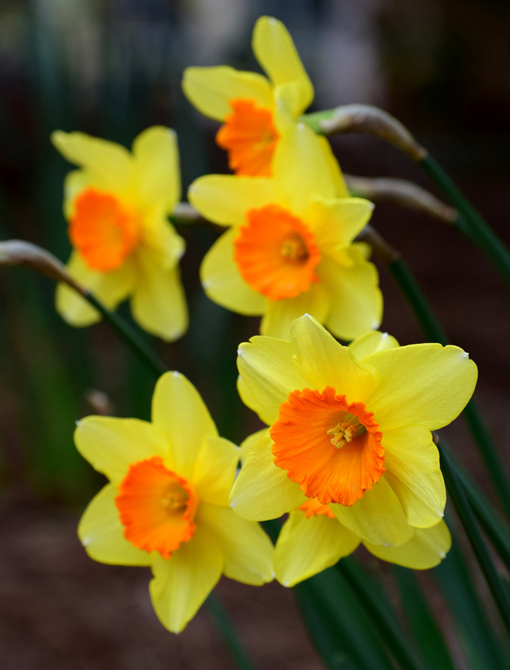 It's going to be a nice weekend, so head over to the Atlanta Botanical Garden for "Atlanta Blooms!" Spring is here, but the seasons change quickly this time of year, so don't wait! 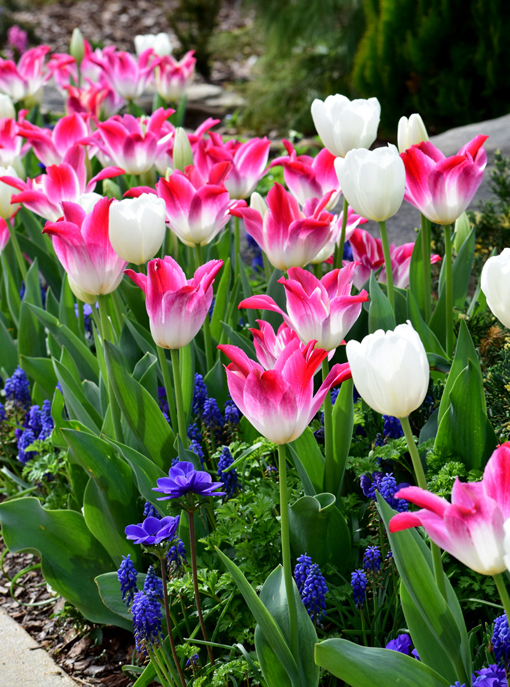 You can enjoy more and larger photos of my visit to the Atlanta Blooms! 2019 event over on the wanderlust ATLANTA Facebook page. If you share them, please give credit to "wanderlust ATLANTA" or "Travis Swann Taylor". Enjoy! 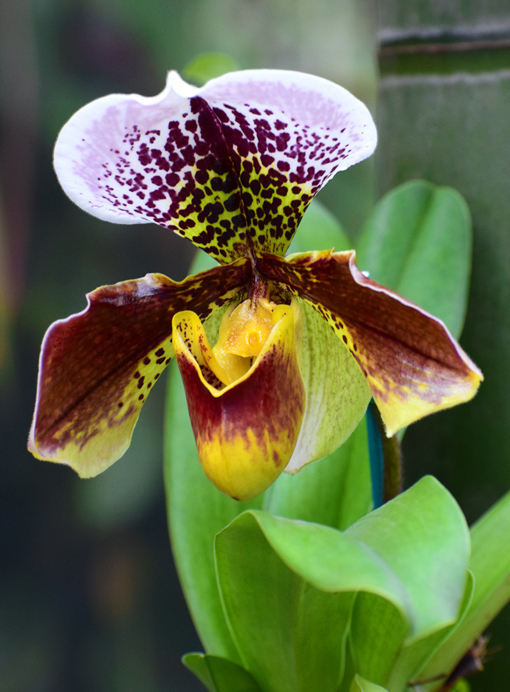 The exhibition begins in the Conservatory Lobby and continues throughout most of the connected Orchid Center. There's not a specific theme, per se, but the exhibition is cohesive and spectacular. The colors, the featured art, and the display techniques are all dazzling. I truly believe you'll just love it! 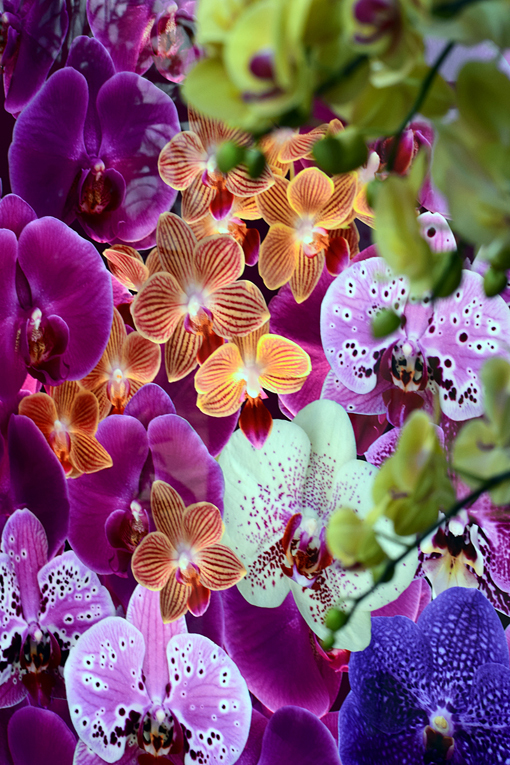 Throughout the Orchid Daze exhibition are brilliant, large-format orchid photographs! They're spectacular! The photo above is one of them, me peeking at it through live orchids on the right and upper right. 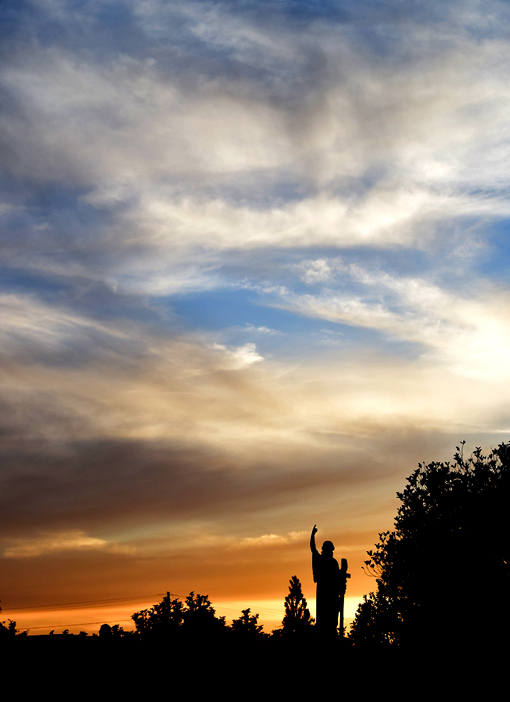 The artist of these magnificent photographs is local, award-winning photographer Parish Kohanim. I've just read a long article about his life and it's fascinating. More than that, his devotion to his craft is heartwarming and inspiring. See more of Parish's work at Parish Kohanim Fine Art. My favorite feature of this year's Orchid Daze exhibition are the six pendulous displays of bamboo canes featuring a wide range of orchids in varying colors, many of them the large-flowered orchids! Those displays are in the Orchid Center. Tomorrow is the Garden's annual Vanilla Sunday, 1pm-4pm. There will be activities for kids and adults, discovery stations, cooking demonstrations and more! 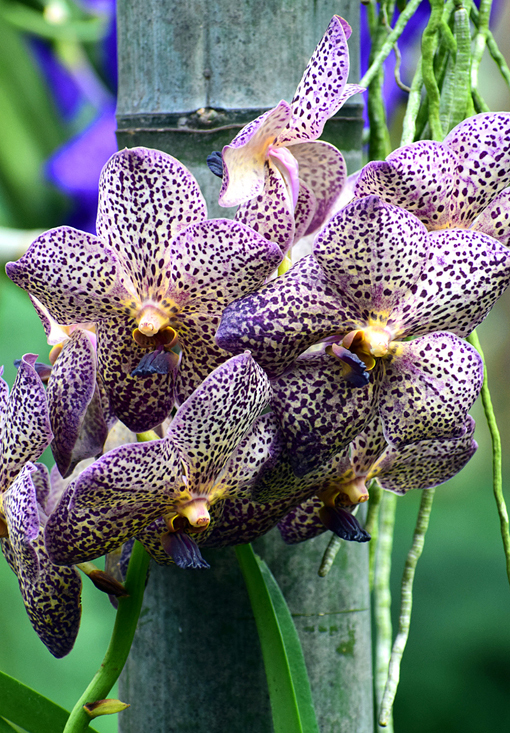 There's another spectacular Parish Kohanim photograph behind these gorgeous orchids! I've mentioned is many times before, but maybe you missed it or your a new wanderlust ATLANTA follower. 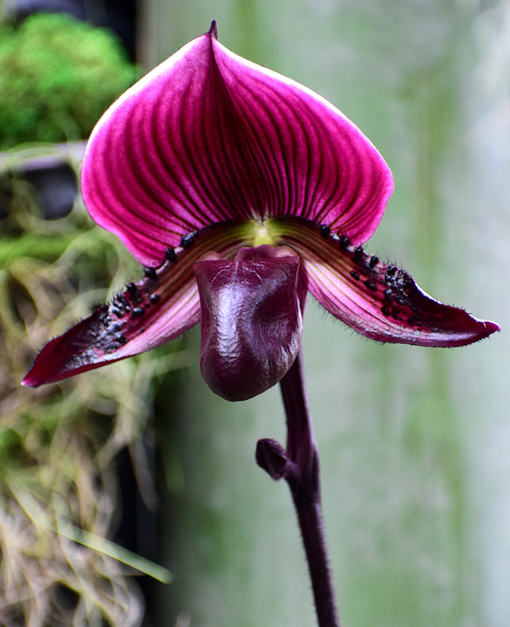 If you're a avid orchid enthusiast, not only do you have to see this exhibition, you'll also want to follow The Orchid Column, a blog about orchids written and beautifully photographed by the Atlanta Botanical Garden's Orchid Center Manager Becky Brinkman. 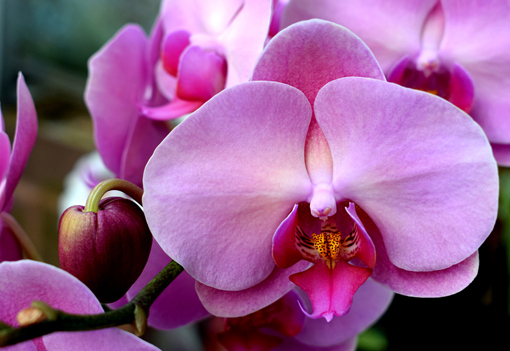 Also, for every level of orchid enthusiast, the annual Atlanta Orchid Society Show & Sale will take place Friday-Sunday, March 8-10, 9am-5pm. I've attended many times over the years and it's always splendid! You'll be glad you went. Think about making it a day at the Garden. 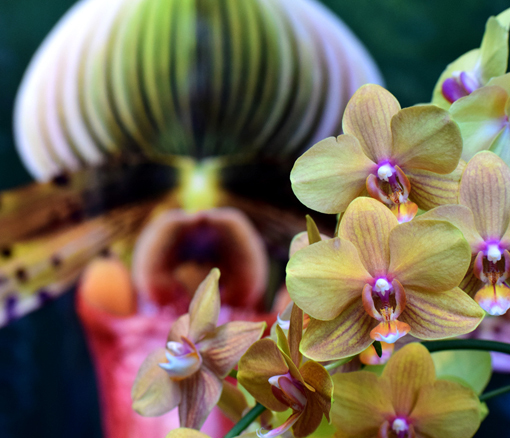 See the Orchid show in Day Hall, see Orchid Daze, see Atlanta Blooms!, make lots of photos to enjoy later, and then take in lunch or dinner at Longleaf! Be sure to stop by the Garden House Gallery to see "Conservation through Creation: The Works of Ed, Philip and Matt Moulthrop", three generations of woodturners! Some of the approximately 40 pieces on display are made from downed trees from the Atlanta Botanical Garden! To give you an idea of the level of craftsmanship and artistry you'll see in this exhibition, they have works on display at the Metropolitan Museum of Art, the American Craft Museum of New York, the Carnegie Museum of Art, and Atlanta's High Museum of Art. The pieces on display are also available for purchase. Speaking of the High Museum of Art, if you missed Yayoi Kusama's "Infinity Mirrors" exhibition, through spring of 2019 you can see her installation "Narcissus Garden" in Storza Woods. The site-specific exhibition is comprised of approximately 1,400 stainless steel spheres arranged by staff from Kusama's studio in Japan. This work dates to 1966! 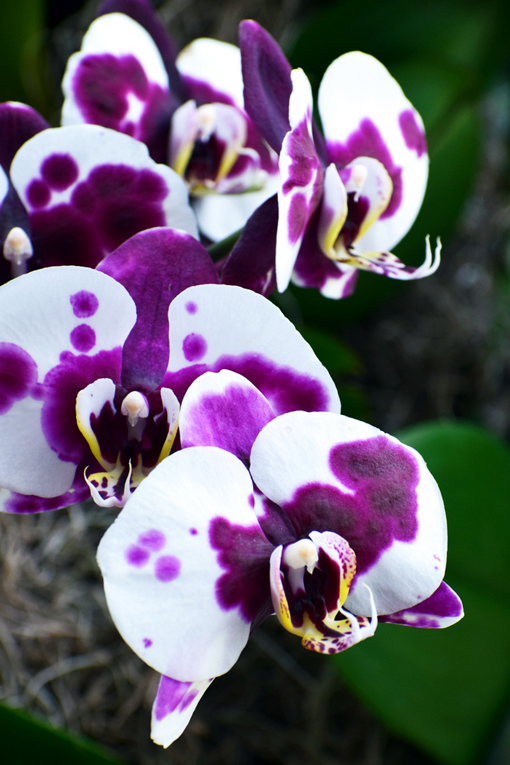 Remember to see Orchid Daze at the Atlanta Botanical Garden by Sunday, April 7, and definitely remember your camera, phone camera, sketch pad, and/or eidetic memory...you'll want remember these beauties well into spring, summer and fall. Since starting wanderlust ATLANTA in 2010, my favorite time of year for writing is my end-of-year recap because it's such a fun ride down memory lane and a reminder of how fortunate I am to be able to see and do so much. I'm grateful to the friends who've accompanied me in-person and fans online...you're all the reason I do this! I'm going to be an author! 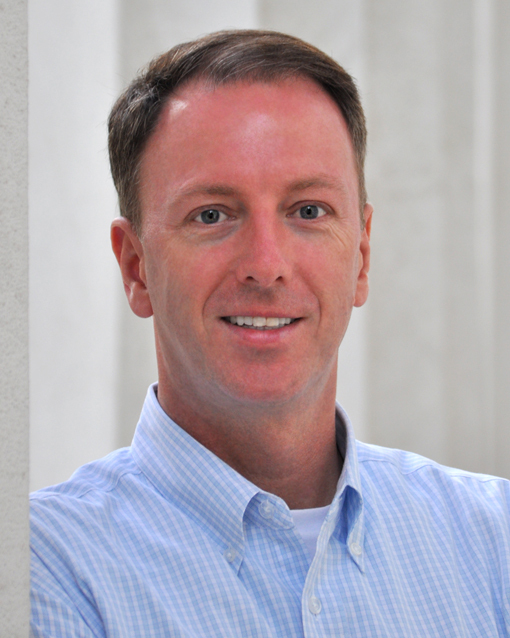 I inked a deal to author--and do the photography for--111 Places' Atlanta book! It's a dream come true! Completed a full year on the Board of Directors at Horizon Theatre before stepping off to fully focus on my book. "Thank you!" to Lisa and Jeff Adler, all the Horizon staff, and a phenomenal Apprentice Company for a wonderful experience! I got to be a panelist at a program for future bloggers and social media influencers through the Association of Food Bloggers. An awesome interview with totally awesome Jennifer Alice Acker, who got married in 2018! "Congratulations, Jen and Brandon!" An interview with Atlanta Rollergirls not long after my very first, incredibly exciting roller derby bout! A double-bout, at that! 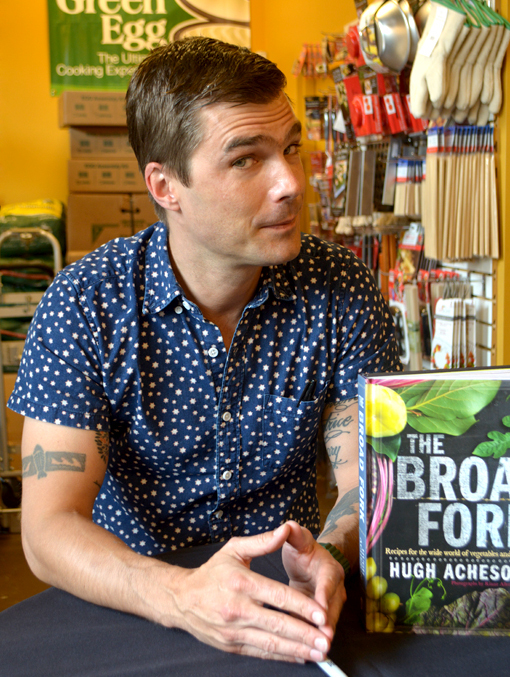 An interview with celebrity chef and author Hugh Acheson! I've been a fan for years and was grateful for this interview. Also dined at one of his restaurants in Athens! 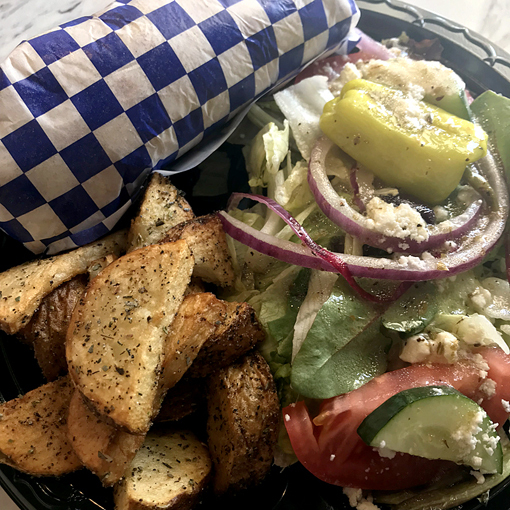 An interview with George N. Koulouris, owner of Grecian Gyro! It was a fun year! 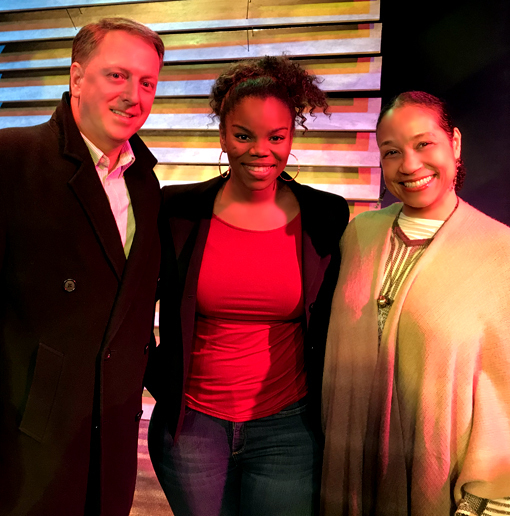 My friend Elisa and I went to see "The Ballad of Klook and Vinette" at Horizon theatre starring the incredibly talented Brittany Inge! 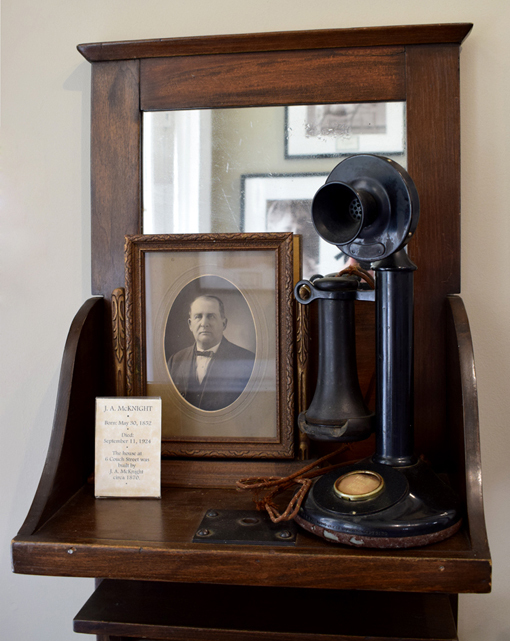 Make your way to Senoia, Georgia, and be sure to include a visit to the Senoia Area Historical Society Museum! 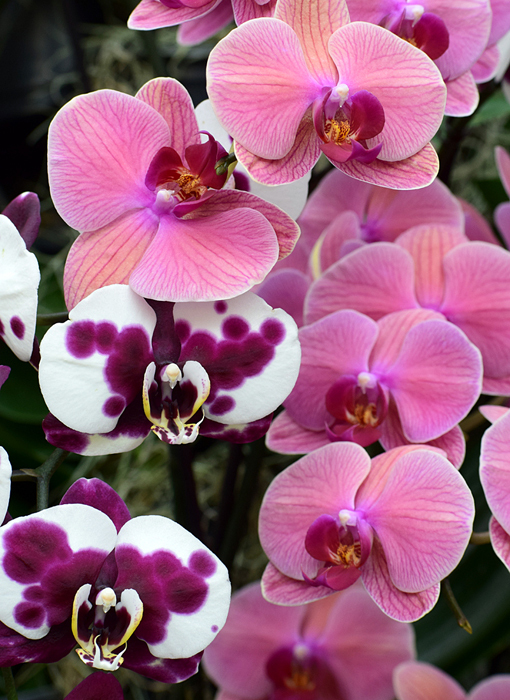 One of my favorite annual events at the Atlanta Botanical Garden is Orchid Daze, a beautiful reason to visit the garden in winter! I highly recommend a visit to Hardman Farm State Historic Site for some fascinating history, historic homes and buildings, Indian mounds, and a lovely estate. 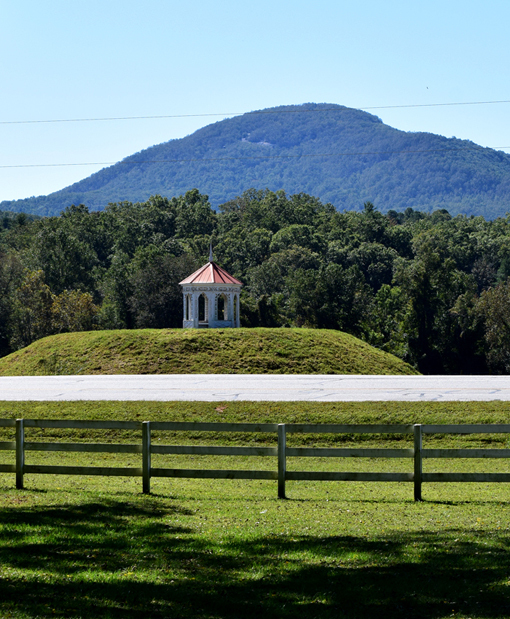 It's just before Helen, Georgia, so make it a double-destination trip! 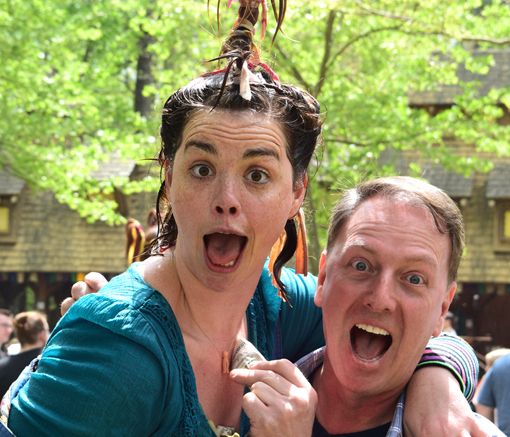 This was my second year attending the Georgia Renaissance Festival...soooo much fun! Be sure to catch a performance by the Washing Well Wenches! 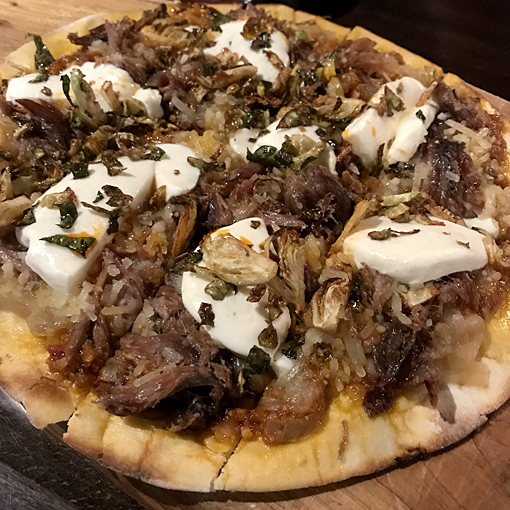 5Church Atlanta continues to be my favorite restaurant and my favorite dish: the Duck Confit Flatbread, although steaks are amazing and brunch is phenomenal! 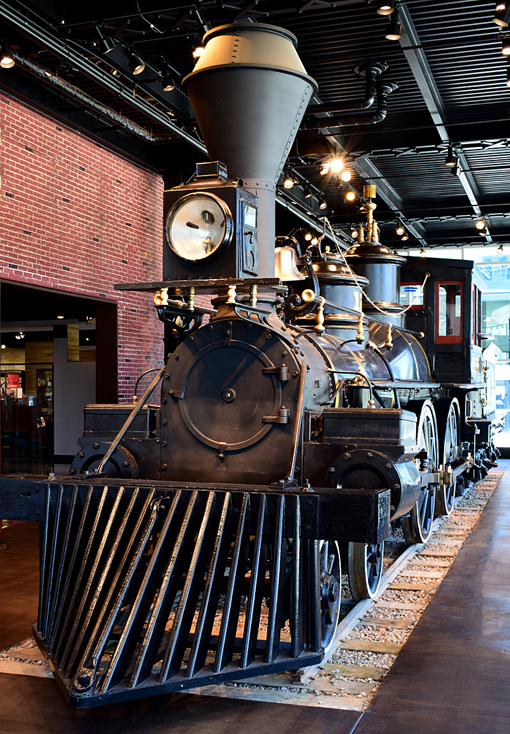 Seeing the Texas Locomotive fully restored (now on exhibit) was exciting and getting a behind the scenes tour of the Atlanta Cyclorama during restoration was fascinating! 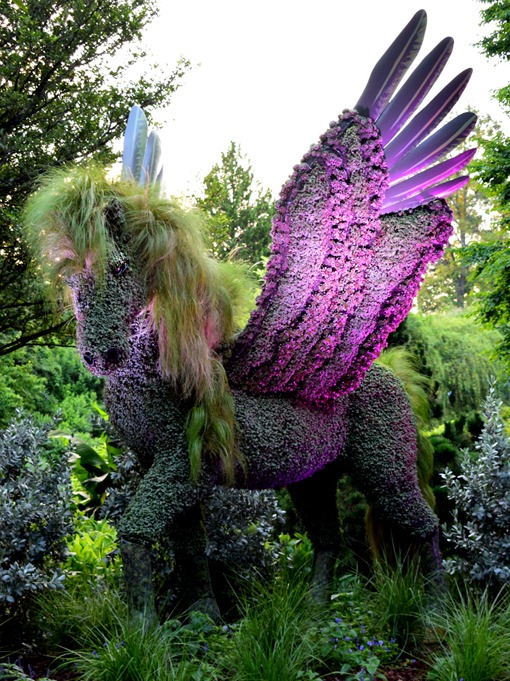 Imaginary Worlds: Once Upon a Time at the Atlanta Botanical Garden far surpassed anything I could have imagined! It'll be back next year, too, with new installations! Tulips are my favorite flow so a visit (or several) to "Atlanta Blooms!" 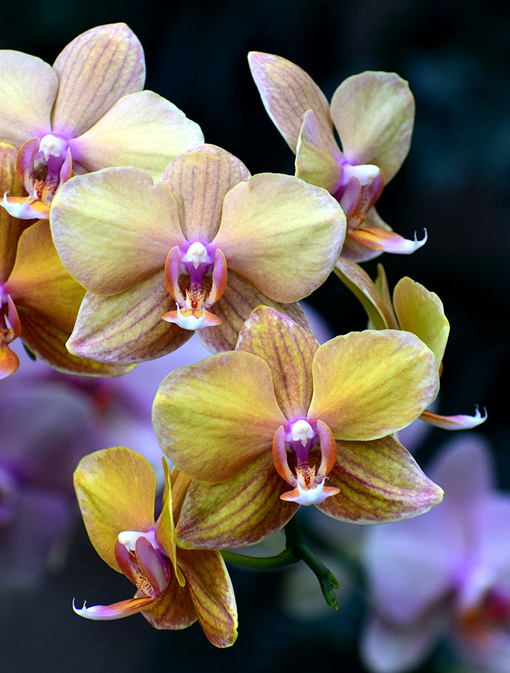 at the Atlanta Botanical Garden is an annual must-do. The Atlanta tourism landscape, in my humble opinion, doesn't give enough attention to how much Latino culture has shaped our international city. 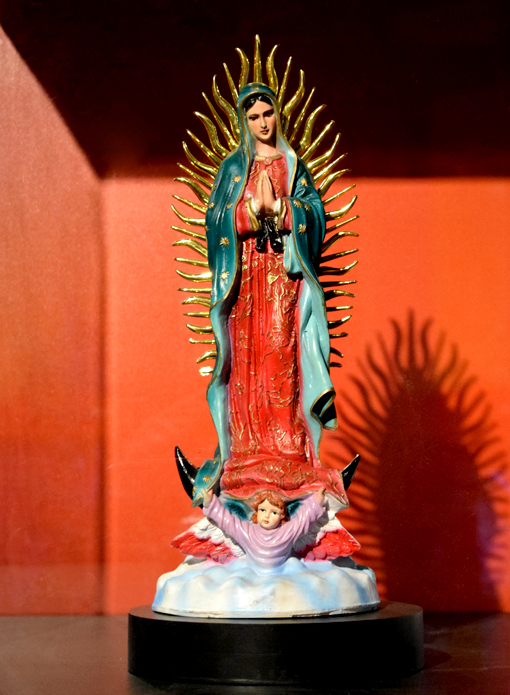 I was excited to see NEUVOlution: Latinos and the New South exhibition at the Atlanta History Center. 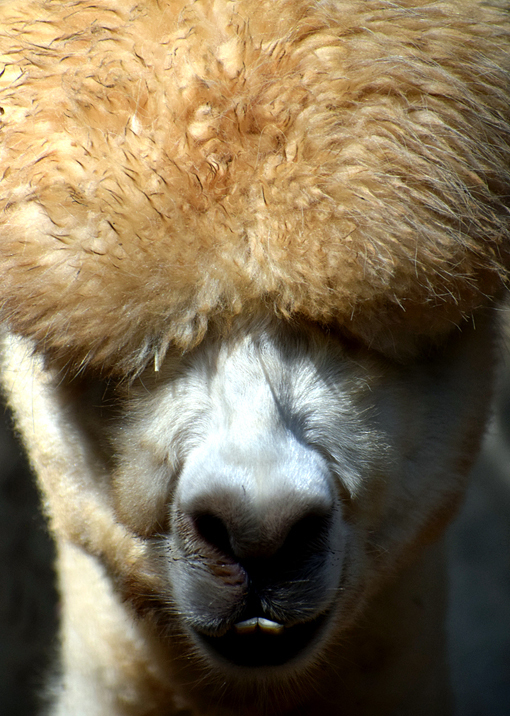 I've been to Zoo Atlanta countless times, but this year I became a member! The Georgia Guidestones had been on my list of places to visit for years and I finally made the trek with my friend Wayne. In one word...fascinating! Many know of my love for Greek food, so dining at and interviewing the owner of Grecian Gyro was awesome! Can hardly wait to go again! 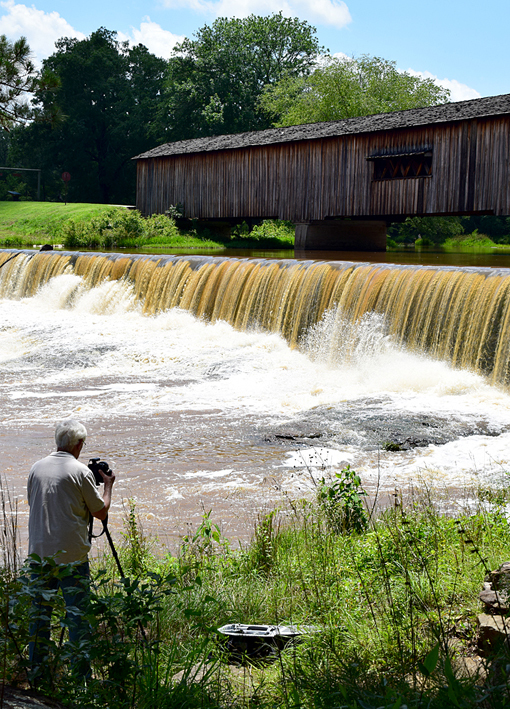 Visiting Watson Mill Bridge State Park was wonderful. The bridge was built in 1895 not using a single nail and it's still in use today! Early in the year I went on a tour of Mercedes-Benz Stadium with my friend Lauralyn and her husband Leo. Even if you've been here for a game, go on this grand tour! Went to Athens, Georgia, specifically to dine at The National, one of Hugh Acheson's restaurants, and he granted me an interview! 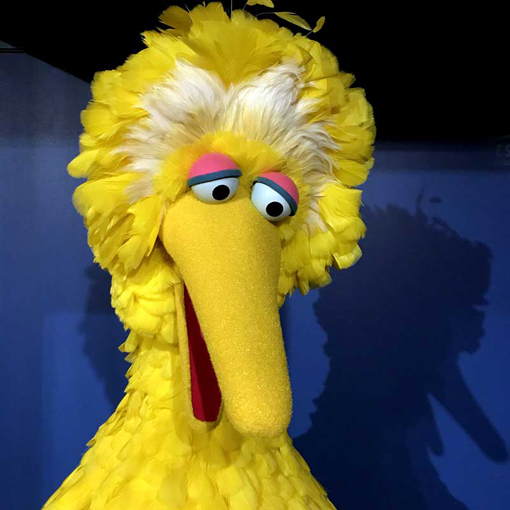 Carroll Spinney, who acted Big Bird and Oscar the Grouch, announced his retirement from Sesame Street this year. Fortunately for those living in and visiting Atlanta, we can see Big Bird and Oscar anytime at the Center for Puppetry Arts. 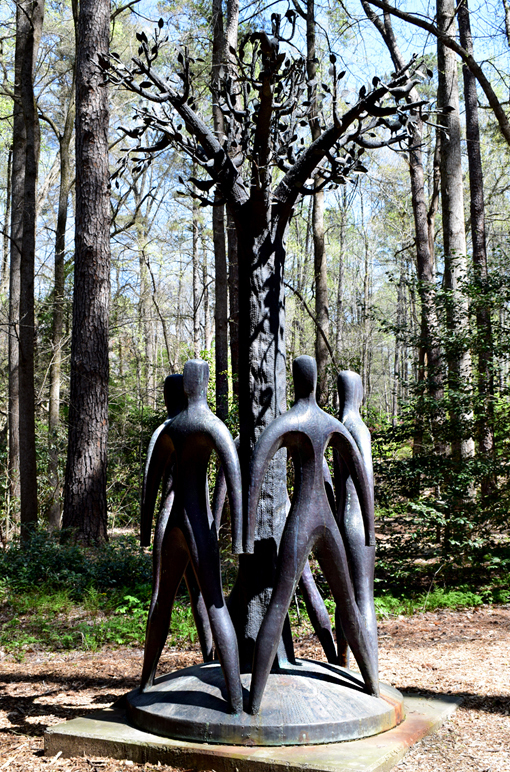 Every spring should include an exploration of the gardens at the Atlanta History Center. There are surprises around every corner! 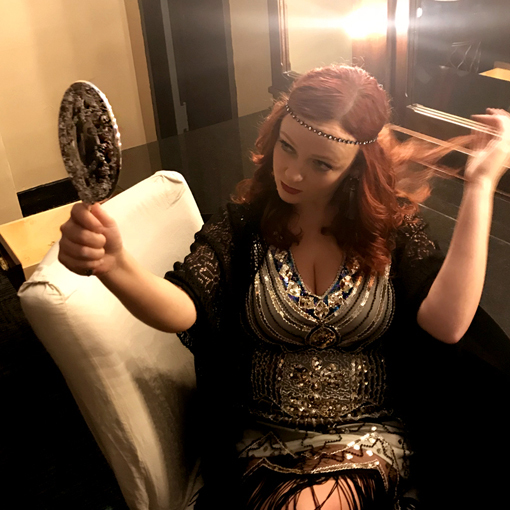 The Fox Theatre introduced a new and improved Ghost Tour this year! 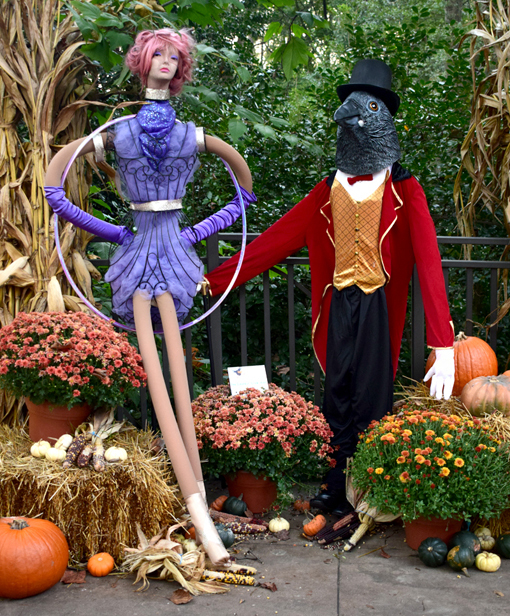 Great fun for kids and grownups alike, Scarecrows in the Garden is a must-see in October at the Atlanta Botanical Garden! I announced this year that I'm going to be an author, a dream come true! It was a good year and again I want to say how grateful I am for my friends and fans. The ultimate goal of my being a blogging has been and continues to be to encourage people to get out and explore their own city, to explore their "own backyards". Again, thank you to everyone for this wonderful journey!